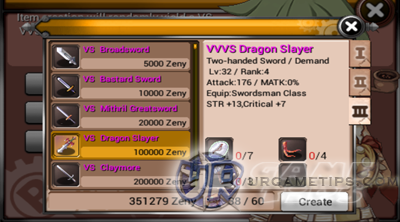 Crafting VS, VVS or VVVS weapons and armors is the best and quickest way to get powerful equips in the game. They can also be used for a longer period of time than most other items dropped by normal monsters. Crafting these items requires a specific set of materials, and you must talk to the correct NPC Artificer to create the item you need. To learn how to do this all, refer to the Crafting Guide below. items. VS = stands for "Very Strong", and so on. and VS versions. Create an item that suits your character build. - VS = Lol almost 100%! - VVS = Around 5%, still possible though. - VVVS = Around 2%, possible with some luck but still very rare! - Craft a 1 Hand Sword, 2 Hand Sword, Staff, or Mace here. - Craft Shields, Armors, Manteaus, and Boots/Shoes here. - Helmets can't be crafted. - Craft your Accessories here! other players instead. Check the Auction Machine NPC for cheap items too. - Runes that can be extracted from items. Merchants (NPCs where you can buy HP and SP potions). them directly from the Cash Shop instead. You can also buy them from other players that likes to trade their Rubies for Zeny, how?, The Ruby user will buy the item you want in the Cash Shop then you'll buy that item using Zeny. Refer here for Cash Shop Items Available for Trade. - To find these Sellers, Yell around towns or Post it at the Message Boards. - Note: Higher items will be dropped by Lvl 50+ Rank 2 or higher monsters. (yellow) materials. It can only be bought by using Gold Coins or Rubies, so if you are a non cash user, you can buy this item from the Event Manager NPC using Gold Coins. Dungeons (all monsters inside drops them, drop rates varies per monster). - Valkyrie Sanctum Instance Dungeon = ??? - Craft Foods here to get temporary stats boosts! - Empty Bottles, Pots, and Plates can be bought from Consumable Merchants. Note: Cooking Materials with "Fresh" are only dropped by Valder monsters.